Image sensors are used primarily in digital cameras and in a large number of imaging devices used in industrial, media, medical, and consumer applications. Due to the growth in demand for cameras, camcorders, multimedia mobile phones, and security cameras the image sensors market is experiencing significant growth. Competition in the image sensors market is high, with manufacturers striving to outperform their rivals with respect to pixel size, pixel count, resolution, and performance. There is also growing competition between established charge-coupled device (CCD) image sensors and the newer complementary metal oxide semiconductor (CMOS) image sensors (Figure 1), with CMOS image sensors improving gradually and moving toward higher-level performance with better integration capabilities and cost advantages. The main difference between the two types of sensors lies in how they convert light into digital signals. Pixels in a CCD image sensor capture the light and move it to the edge of the chip where it is converted into a digital signal. In contrast, pixels in a CMOS sensor capture light and directly convert it into a digital signal. Uptake of CMOS image sensors for use in automotive and handheld communication devices are expected to be growth drivers for the CMOS image sensor market. Advances in packaging technology continue the push toward higher-resolution sensors in mainstream application markets. The impact of this driver is anticipated to be medium during the short term of the 2010–2012 forecast period. As the mobile device market attains saturation, image sensors are likely to witness stagnant demand and the impact of packaging is expected to drop during the rest of the 2010–2015 forecast period. Advances in various digital technologies allow manufacturers to more easily incorporate functions that were previously independent or that could not be integrated into a single device. Manufacturers use these advances to differentiate their products within the market and to meet growing demand for compact devices, many of which incorporate digital cameras. For example, a standard mobile phone comes with a camera, wireless connectivity, music playback capabilities, etc. These all-in-one devices are very popular, resulting in increased production volumes for image sensor units, for both CCD and CMOS sensors. Digitization allows image files to be electronically stored, archived, and retrieved in an efficient manner, and eliminates the need for film files. Traditionally, most of the major market participants in the image sensors market are located in Asia, and more specifically in Japan. Among large companies, Sony and Matushita are located in Japan, as are Hamamatsu and other medium-sized market participants. Most of these manufacturers focus on improving existing products and developing new image sensor products. The electronic manufacturing industry is increasingly using subcontractors to build the products and more subcontractors are purchasing image sensors to develop their own digital cameras and other products that use image sensors. Since outsourcing allows the OEMs to reduce their manufacturing costs, it allows these manufacturers to penetrate the market with less-expensive products, which is increasing the overall demand for image sensors. As more OEMs use subcontractors in Asia over the next nine years, the expansion and growth of electronic manufacturing will continue to drive image sensor market growth, with medium impact in the 2010–2012 short-term forecast period and high impact in the long-term 2012–2015 forecast period. The external conditions, such as the intensity of ambient light, affect the quality of the images obtained. The sensitivity of the current crop of sensors results in dark and blurred images. Leading image sensor manufacturer Eastman Kodak has introduced a product that addresses these shortcomings by improving sensor sensitivity, leading to improved image quality under low-light conditions and for moving objects. Along with the transformation to sensor diagrams, the new sensor technology enables smaller pixels without affecting image quality. By enhancing the light sensitivity by a factor of two to four times, the camera's shutter speed is increased, which eliminates blurring problems. Kodak has also improved the Bayer pattern—a particular arrangement of color filters used to produce a color image in most digital image sensors—by including panchromatic or clear pixels along with the red, green, and blue pixels already present on the sensor. Because the clear pixels are sensitive to all light wavelengths, they collect a higher amount of light. There are some consumer applications such as Personal Digital Assistants (PDAs), mobile phones, and PC cameras that require low-cost, low-power image sensors. While this consideration does not significantly affect the industrial and scientific market—these applications place greater emphasis on sensor performance than on sensor power consumption—it will have a stronger impact on sensor demand for low-end electronic applications where power consumption is a key attribute. We predict that energy consumption considerations will favor the use of CMOS image sensors because they consume less power and require fewer external components than do CCD image sensors. Responsivity is the size of the signal delivered by an image sensor per unit of input optical energy. Both CMOS and CCD sensors exhibit low responsivity, although CMOS image sensors are marginally superior to CCDs in terms of ease of manufacturing because the gain elements are easier to place on a CMOS image sensor. Every pixel of a CMOS sensor has its own charge-to-voltage conversion and the sensor contains built-in amplifiers, noise correction, and digitalization circuits. These additional functions lead to design complexity, a reduced area available for light capture, and a reduction in pixel-to-pixel uniformity. In CCD sensors, the charge of each pixel is transferred to a single output node where it is converted to voltage and output as an analog signal after buffering. As a result, much of the pixel's area remains available for capturing light, leading to a high level of uniformity. Some CCD manufacturers use new readout amplifier techniques to improve responsivity and uniformity. Due to the varying light conditions, captured images are often overexposed; the ability to drain localized overexposure without compromising the rest of the image in the sensor is called antiblooming. 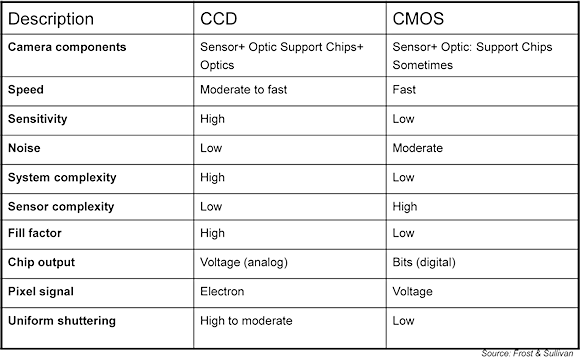 CMOS sensors generally have natural blooming immunity because of the way light-to-signal conversion takes place within their pixels whereas CCDs require specific engineering to achieve this capability. Most CCD image sensors that have been developed for consumer applications possess built-in antiblooming capability in contrast to most of the CCDs that have been specifically developed for industrial and scientific applications, which do not. This lack affects the quality of images in industrial applications and also affects the scientific analysis of images, an important limitation for research and industrial applications. CMOS-sensor-based cameras perform best in the presence of bright lights although their sensitivity to low or poor lighting conditions has not yet been established. Their performance in bright light is the major reason behind the use of CMOS sensors in external (outdoor) applications. However, their sensitivity to light is hindered by the obscuring of individual photodiodes by circuitry to filter out noise and facilitate other sensor functions. The ratio of the pixel that is dedicated to gathering light to the total area of the pixel is known as the pixel fill factor. While CCDs have a 100% pixel fill factor, CMOS image sensors have a lower pixel fill factor. A low pixel fill factor means that the sensor is less sensitive to light and requires a longer exposure time, making indoor camera applications more challenging when the sensor is used without an additional flash. CMOS sensor light sensitivity still needs to be improved to allow CMOS-based image systems to be used in all conditions, irrespective of the ambient light conditions. Until CMOS sensitivity is improved, it will continue to affect the CMOS sensor market, with an estimated impact that will remain medium throughout the 2010–2015 forecast period. CMOS image sensors are produced in bulk for many low-end applications, e.g., low-end digital still cameras, PDAs, and mobile phones, with a cost of production ranging from $4–$10, depending on the application. CCD image sensors are more expensive to produce because they are manufactured using a more specialized manufacturing process. According to industry sources, it takes approximately 18 months to develop a new CMOS chip, whereas it takes about eight months to develop a simple CCD chip. CCD image sensors tend to be more popular and cost-effective in high-end, professional consumer electronic products. Cost savings from using CMOS rather than CCD technology in low-end consumer electronic applications has allowed significant price reductions for the OEM, thus helping them lower manufacturing costs. 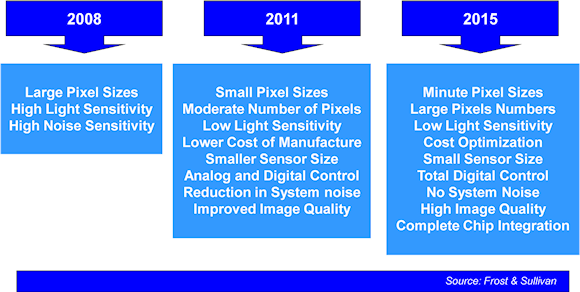 Figure 2 shows the market and technology roadmap for the total image sensors market from 2008–2015. All of these improvements are ongoing and are expected to result in higher image quality by 2015. 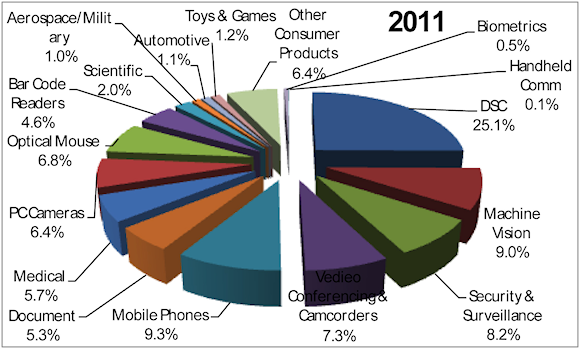 In 2010, the revenues for the world image sensors market were $3,910.8 million, an increase of 9.7% over the 2009 revenues. The world image sensors market is growing, with a predicted annual growth rate of 10.2% in 2015; however, some of the individual product types are likely to experience higher growth rates. Industry participants expect the market revenue to continue increasing throughout the 2010–2015 forecast period. It is worth noting that, unlike most of the markets showing lower growth rates, the image sensors market is one of the few that continued to grow through the post-2001 economic slowdown and the 2008–2009 global economic downturn. Total revenues are expected to grow at a compound annual growth rate (CAGR) of approximately 9.9% from 2010–2015, to reach revenue of $6,283.9 million in 2015. Digital still cameras continue to be the largest end-user market both in terms of revenues as well as applications, ranging from high-end industrial uses to low-end consumer applications. Other end-user markets that are increasingly using image sensors are mobile communications, medical applications, optical mice, videoconferencing, toys and games, and biometrics. Figure 4 exhibits the revenue share by end use for the total world image sensors market. Image sensor applications are expanding to different end-user industries year after year. The type of configuration can vary from application to application but the most common trend is to use a sensor IC with an integrated microprocessor. The most important functional features for an image sensor system are accuracy; reliability; image sharpness; performance under low-light conditions; easy download; transfer and replication of images; and long life. The two major segments—CCD and CMOS—of the world image sensors market offer a range of image sensors for multiple end uses. The world image sensors market is poised for growth, with certain factors likely to aid its growth during the period 2011–2015. Dr. Rajender Thusu is Industry Principal, Sensors Practice (Measurement & Instrumentation) for Frost & Sullivan, Dallas, TX. He can be reached at 210-520-0941 or [email protected].